Thick and crunchy strings of dough twisted around chopped nuts such as pistachios, pine kernels, or cashews. It is one of the richest Middle Eastern sweets in nuts and sugar syrup. Pistachios or cashews, ghee, flour, sugar, cornstarch. Borma is unique from many aspects. When compared to other Middle Eastern desserts, it is one of the richest in nuts. This makes it one of the most desired pieces. It is commonly known that the more of it an arrangement of assorted Baklava contains, the richer and more valuable it is. 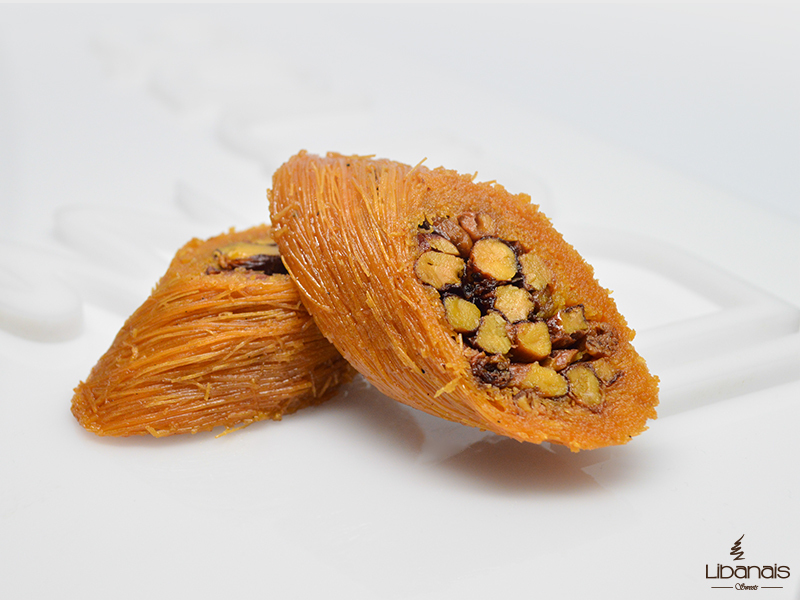 Moreover, its unique, twisted, and open top and bottom shape that exposes its abundance in nuts makes arrangements of assorted Baklava containing Borma more visually appealing and attractive. Furthermore, its crunchy thick strings of dough heavy in sugar syrup give it a texture and a sweet taste unparalleled by any other piece of Arabic pastries. Pronounced [bor-mah] and sometimes written “Burma”, it comes from the Lebanese word for “Rounded”. It got its name from its unique rounded shape. First the stringy Knafeh dough and the sugar syrup are prepared, then the Borma cylinders are formed and baked. Knafeh dough consists solely of flour and water. To prepare it, flour and water are mixed for about four hours to form a watery mixture. Then the mixture is poured into a special container that contains small holes in its base and placed on top of a hot surface. As the watery dough mix passes through the holes, it forms filaments of dough. The container is moved along the hot surface as the dough mixture drains through the container to form long strings of dough. The strings of dough are then let to dry, and voila, you got the stringy Knafeh dough. First, a large number of long strings of Knafeh dough are placed on a flat surface to form a long block of rectangular shape. The thickness of the block of dough determines the thickness of the crust in the finished product, while its width determines the diameter. Pistachios or cashews is then added on top of the dough. Next, the stringy dough is rolled over the nuts filling in an oblique direction to form long cylinders. Finally, the cylinders of raw Borma are let to dry for 24 hours. Ghee is added on top of the Borma cylinders which are then baked for one hour on medium temperature. After baking, the remaining butter ghee is drained and sugar syrup is added. The cylinders are left to cool for 24 hours, then are placed on top of a porous surface for 10 hours to drain the sugar syrup. Borma is offered as a dessert. It is sweeter and heavier than most other types of assorted Baklava, so make sure you keep room for it. It is usually served as part of Baklava arrangements. Borma is famous in all Middle Eastern and Arabic countries, especially in Lebanon, Syria, Palestine, and Jordan. In Syria, it is instead called “Mabrouma” which also comes from the Arabic word for “Rounded”, and it usually features a larger diameter than the Lebanese version. Just like all the other types of assorted Baklava, Borma is gradually gaining worldwide popularity especially in the United States and Europe. Borma is one of the assorted Baklava pastries that are made with knafeh dough. Assorted baklava pastries are made of two forms of dough: Paper thin sheets of phyllo dough, or thin strings of dough called knafeh dough. While many types require the knafeh strings of dough to be shredded, Borma takes advantage of the stringy shape of the dough to give it a unique texture. It is considered one of the most desired Arabic sweets. Baklava is available for sale on our secure online store, on our Amazon store, at a grocery store near you, or in our retail stores.